Sea shanties play as the audience takes their seats in a community hall in 1955. Upstage, a line of chairs is draped with articles of costume and props, and four large, movable blocks are fitted together at centre stage. The music dies down and the Pallas Players briskly make their way on stage. Discussing a few last matters between themselves, they face their audience as Flora Bellerby (Sally Armstrong) informs us of the absence of a popular Pallas member, and to ask our patience with them, particularly for stand-in Juliet Mainwaring (Alicia McKenzie). Formalities over with, the Players take their places, and their rendition of Whisky Galore begins. The meta-narrative of the Pallas Players, based Nancy Hewins’s real-life company the Osiris Players, offers a comedic touch, allowing for moments which deviate from the story and create a sense of complicity with the audience. With a cast of only seven, the diverse and vibrant characters are shared between the small ensemble, who switch between each role with style and ease, seamlessly adopting the mannerisms and accents that differentiates each from the others. Despite the complexities involved and the thickness of some of the accents, the cast is consistent and competent throughout the show. The Pallas Players deliver energetic and immersive performances, confidently displaying their acting range through their ability to embody each of their multiple roles. Whisky Galore, adapted from the 1947 Compton McKenzie novel of the same name, is an easy, light-hearted watch. The first act presents us with the plight of the Scottish communities of Great and Little Todday, who have been bereft of their treasured whisky, the latest casualty to the rationing of the War effort. In spite of this suffering, joy blossoms in the love between two betrothed couples, Fred Odd (Shuna Snow) and Peggy Macroon (Lila Clements) and George Campbell (Lila Clements) and Catriona MacLeod (Joey Parsad). Yet the lovers are hampered by the protestations of George’s overbearing and bitter mother, Mrs Campbell (Christine Mackie) and Peggy’s father, Joseph Macroon (Joey Parsad), made even more cantankerous by the whisky drought. Meanwhile, the uppity Paul Wagget (Isabel Ford) is determined to enforce English discipline amongst the islanders and is optimistic that the absence of their favourite tipple should aid his cause. That is, of course, until the SS Cabinet becomes wrecked off the shore of Little Todday, with a cargo of 264,000 bottles of whisky onboard. The play makes innovative use of the four blocks, which are shaped, most impressively, into Waggett’s den and his prized car, amongst other parts of the scenery. Despite their size, the cast handles the blocks very well, preventing the movement of them from interrupting another’s lines or distracting from an ongoing scene. This successful integration of the scenery serves to deepen the sense of immersion provided by their effortless performances. Despite the tireless drive of the cast, Whisky Galore loses its momentum during the second act. Although the performances remain faultless, there is a lull in the story, the cat-and-mouse element between the islanders and the authorities feeling somewhat underdeveloped. If there were one or two more scenes dedicated to showing the islanders’ sneaking of their scavenged whisky under the noses of Home Office officials, the resolution to the play would feel less rushed. While the play runs out of steam midway through, though, the performances certainly do not. The energy and talent of the cast bring charm, humour and life to this production, making it an engaging and endearing watch. 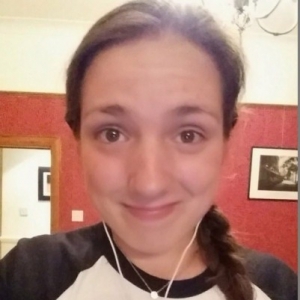 Grace Dillon is a third year undergraduate, studying English Literature. She is a long-time performing arts enthusiast, having loved to act in and attend performances from a young age. Outside of university, she enjoys reading, watching films, travelling and writing.